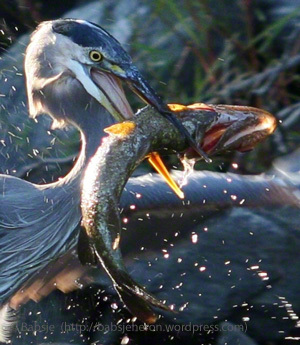 Yes, even Great Blue Herons strut and march, especially when protecting their turf. This Great Blue Heron marching down the shoreline to deter an interloping bird showed off an example from their powerful body language repertoire: the erected back feathers. Thanks to Ailsa of “Where’s My Backpack” for her recent Travel theme: Walking. Do strutting and marching count as “walking?” Yes, I say! Thanks to Jeff G and WordPress for their recent WPC Challenge: Ambience. The mood in the cove that day was suspenseful as the adult heron marched the length of the upper shore in an aggressive effort to stake its territory. It was a powerful display of the birds’ urges to claim and protect their feeding grounds. Posted on January 21, 2017, in ardea herodias, Art, Audubon, Bird photography, Birds, Great Blue Heron, Nature, Photography, Photography challenge, postaday, Weekly Photo Challenge, Weekly Travel Themes, Wildlife Photography and tagged postaday, womens-march. Bookmark the permalink. 2 Comments.